Generate - Does the indices generation and creates a treeview Menu with the project indexed. After the generation is done it opens the Documentation page. Upload - Used to include images or files within the documentation. Links - Interface to Express Edition to link Project Applications (queries, forms, etc.) with the Documentation page. 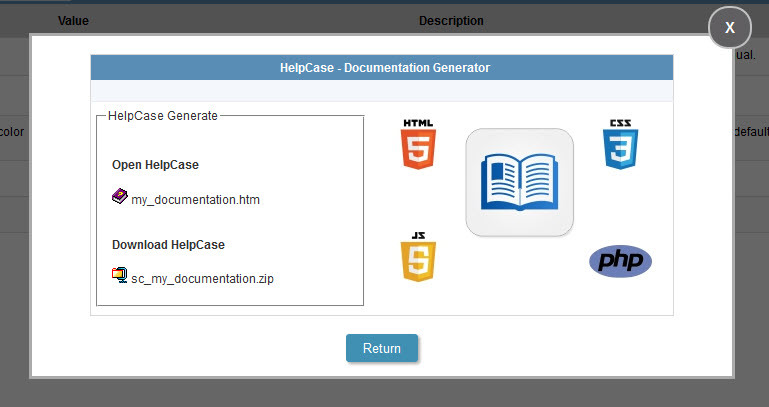 Open HelpCase: Open the documentation within a new page. Documentation download: Download the zipped documentation . The image below presents a generated Documentation.